The Slide Fire started on May 20, 2014, and was fully contained 16 days later. 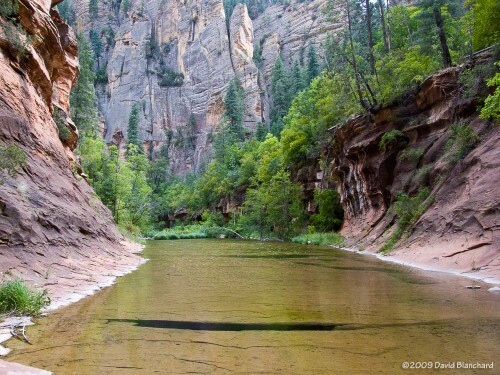 In the aftermath of the fire, Coconino National Forest closed much of Oak Creek Canyon for safety reasons. Four months later, on October 1, the restrictions were lifted and recreational activities resumed. 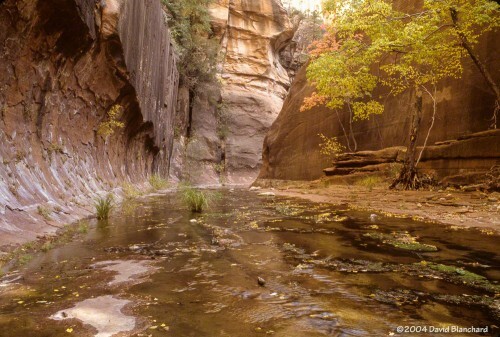 We wondered how much—or how little—of West Fork Oak Creek (WFOC) had burned. There had been some information during and just after the fire indicating that in the lower section of the canyon there was only light to moderate burn severity and only over a small percentage of the canyon. (Detailed map from InciWeb.) Farther up in the headwaters there had been widespread low intensity burns. Typical burn scar seen in the lower reaches of West Fork. So, finally, we hiked up WFOC to see for ourselves. The information was essentially correct and only small portions had burned and at low intensity. The canyon had survived. But there was still significant damage. Because of the burned areas farther up canyon, heavy rains this summer caused a lot of soil and ash to wash into the creek and flow downstream. The creek channel was filled with silt and black ash. Where once the creek bottom had been smooth sandstone it now had several feet of silt and ash with deep channels carved through the silt. This will slowly evolve back to its original state as winter rains and summer thunderstorms over the coming years flush out the silt and ash. On a brighter note, we did see a late crop of ripening berries along the creek. Tasty! 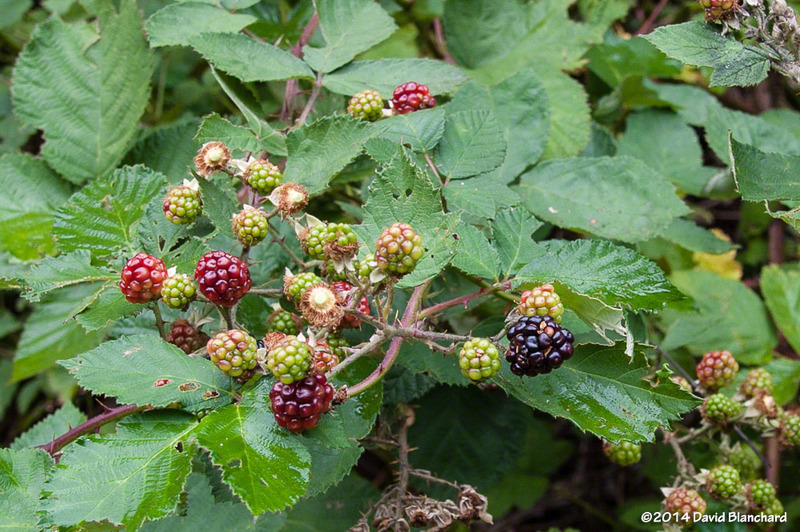 A late season crop of ripening blackberries along West Fork. 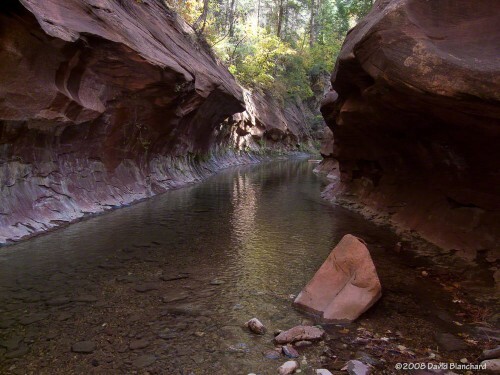 One of the most significant changes occurred at the end of the West Fork Trail. The trail ends around 3.3 miles from the trail head where the canyon narrows and deep water is found from edge to edge. 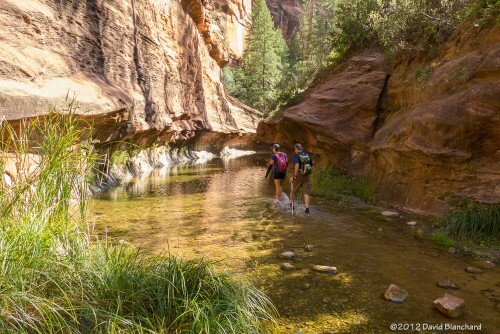 To travel farther upstream requires wading through water that is thigh deep in places. 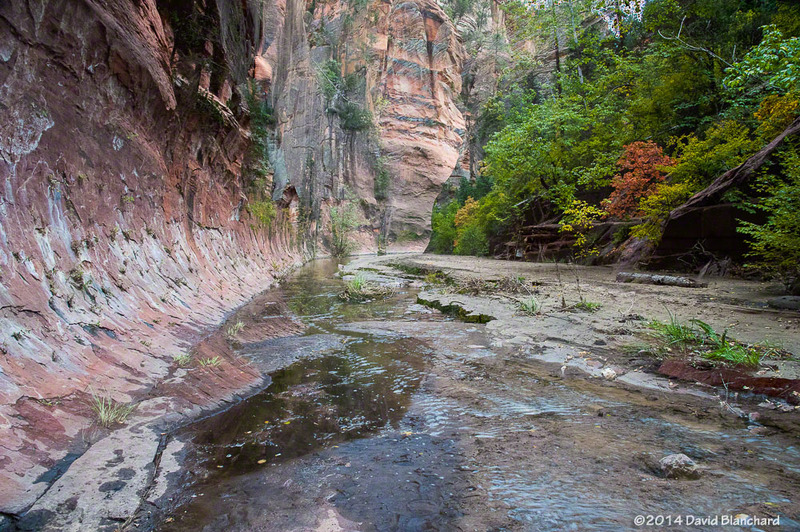 Most hikers turn back at this point; a few hardy hikers accept the challenge of water and no trail and continue upstream for many miles. 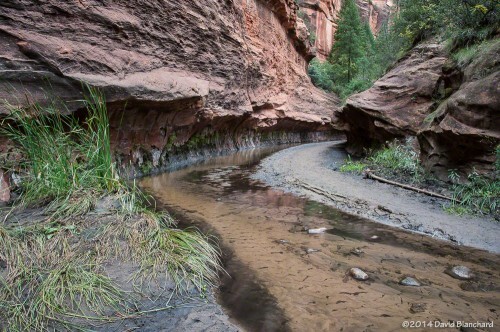 End of West Fork Trail in 2012 with water-filled channel. End of West Fork Trail in 2008 with water-filled channel. End of West Fork Trail in 2014 with silt-filled channel. That has changed now as silt fills the slot canyon and a firm trail now exists where it once was only water. 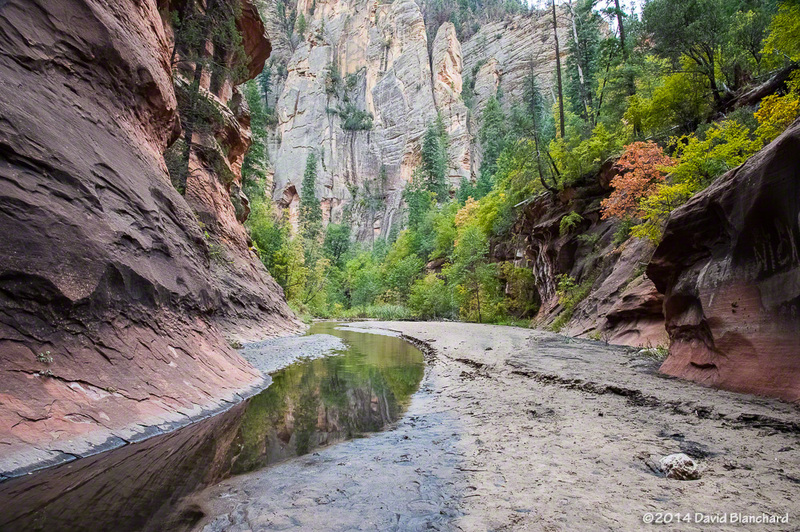 Here are additional before and after images of West Fork Oak Creek. This is the first large pool most hikers see as they travel up West Fork Trail (2011). This is the same pool in 2014. Ash and mud line the banks. Several miles up the canyon the walls of the canyon close in again and water is found from edge to edge. A wide and shallow pool stretches from wall to wall in this section of West Fork (2009). The same section is now filled with silt and ash with a narrow channel carved in the debris. This is the same pool as above but viewed from downstream (2010). The once-sparkling pool of water is now filled with silt and ash (2014). 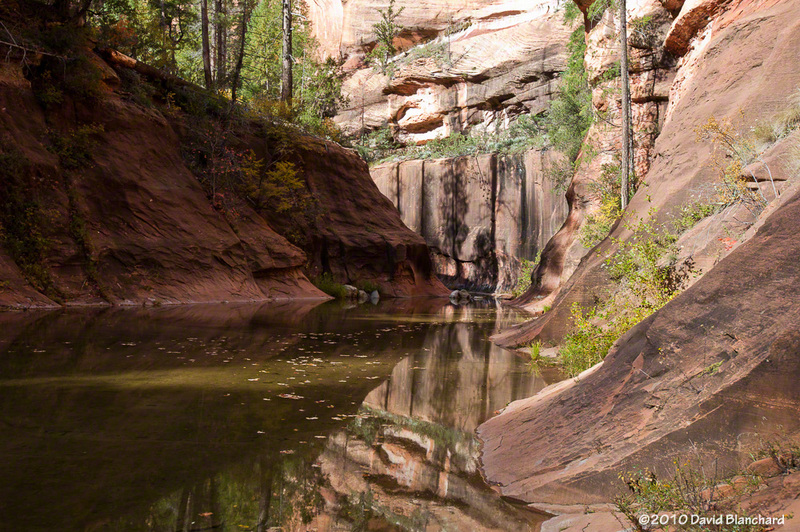 Just upstream and around the corner from this pool likes another narrow portion of the canyon with this large and smooth sandstone wall with trees. 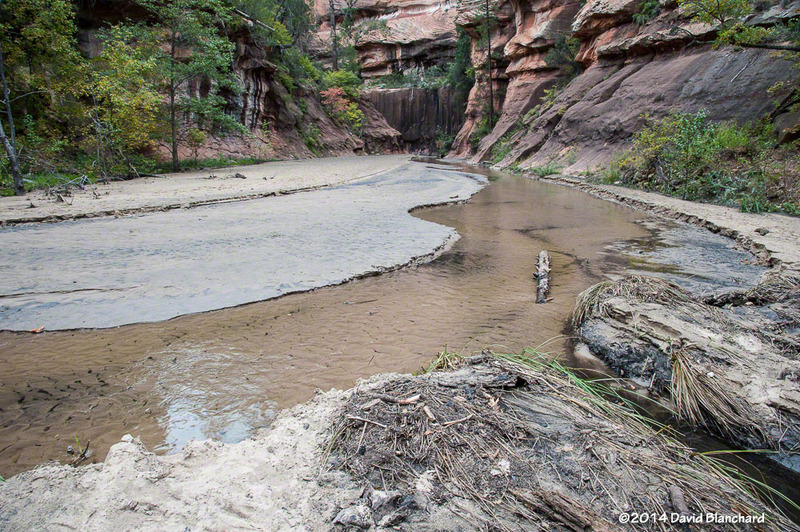 The sandstone floor of the creek bed has been filled with silt but the trees remain safe above the water and silt. 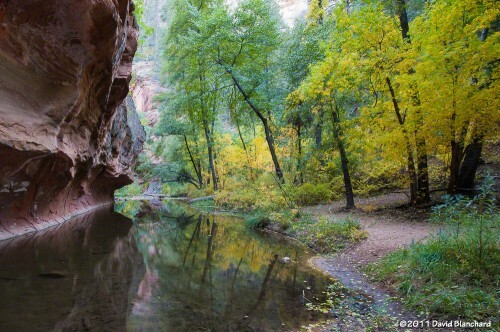 Narrow “slot canyon” with trees (2004). Silt and ash now cover the creek bed (2014). 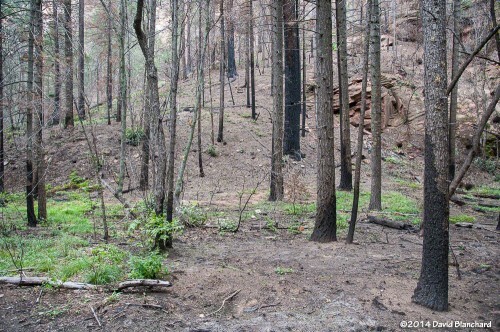 Fire is an essential part of the ecosystem in northern Arizona and the Slide Fire may have done more good than harm since much of the burn severity was low or moderate. 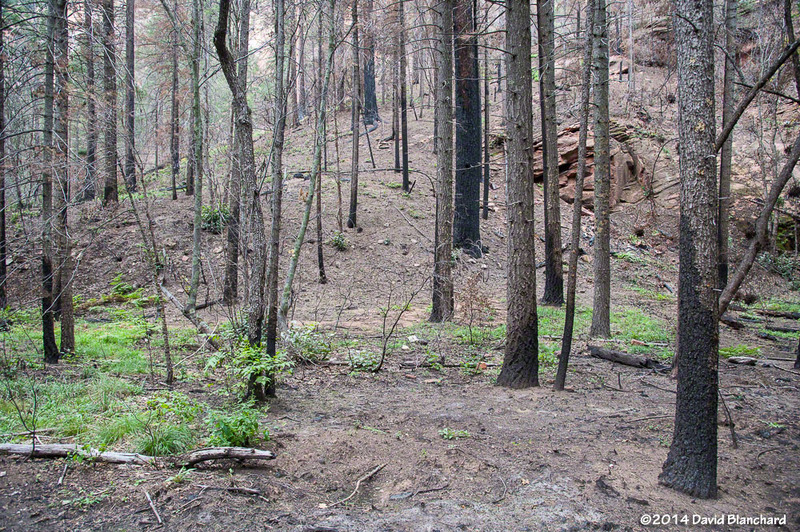 The fire removed a lot of fuels on the forest floor and have provided nutrients for the future of the forest. 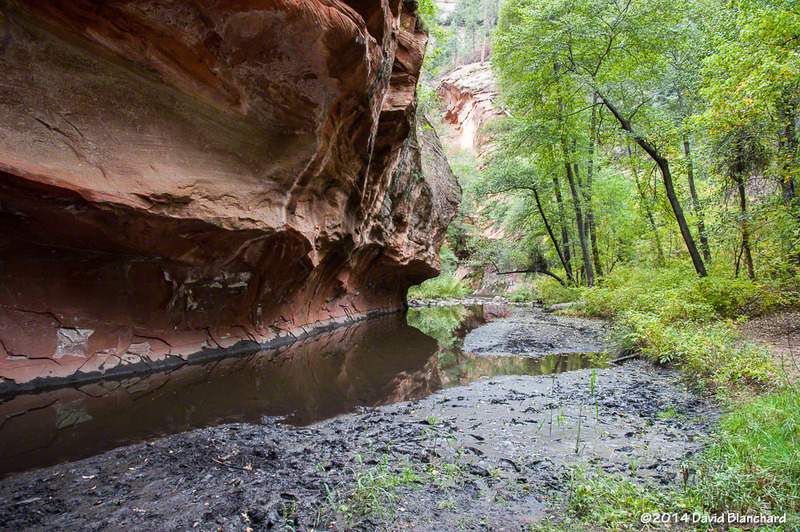 In the short term the silt and ash have filled many pools and covered the sandstone floor of the creek bed but these are not long-term harms. In time, the canyon will return to what it was before.